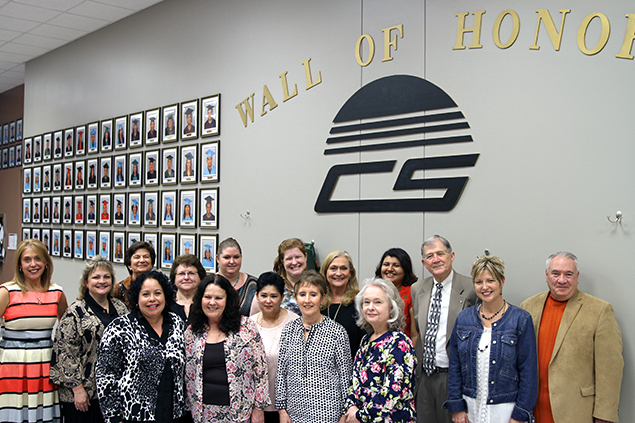 Pasadena ISD’s Community School celebrated a major milestone Thursday, March 26 – graduating over 500 seniors since the school opened its doors in 2010. Students, staff, district administrators and Board of Trustees joined in a celebration hosted by Community School Director Tom Swan. Mark Cruz celebrated graduation by posing for a traditional picture in cap and gown for the Wall of Honor in Community School. Community School graduate Mark Cruz gets help putting on his cap and gown by one of his favorite teachers, Donna Groce. The Community School allows individuals who are a few credits shy of graduating an opportunity to earn a diploma through flexible schedules and programs designed to fit a student’s learning style. This makes it possible for students to receive one-on-one instruction with licensed teachers outside of the traditional classroom. The school provides high school students enrolled in Pasadena ISD former PISD students who have dropped out and are still living within the district limits a chance to graduate. Community School students have several options to choose from to achieve a diploma. With the High School Initial Credit or Recovery Evening Program, full-time Pasadena students can make up deficiencies in credits or earn additional high school credits. The school’s Second Chance Program offers morning, afternoon and evening classes. The Community School also partners with the Harris County Department of Education to provide GED classes at no cost to students. Five years and 500 graduates later, the program has established itself as a positive alternative that upholds the district’s overall goal: to provide students with a quality education. “The Community School not only provides students with a diploma, it gives them hope for the future,” Swan said. Dr. Kirk Lewis, Pasadena ISD school superintendent, addresses a crowd full of Community School students and staff during the celebration. Board of Trustees join in the celebration and congratulate Community School students and staff on the milestone. It was a special day for Mark Cruz, who graduated from the Community School the day of the celebration. Pictured from left: Donna Groce, Mark Cruz and Tricia Cave. Community School staff take a group photo to commemorate the occasion.